So my top tip for eating out in Korea? Learn the names of meals. After all, you don’t want to end up with chicken feet or intestines by accident, do you? Once you know what’s what, you can relax and enjoy the food in all its glory. Of course, much like the snacks, there I some main meals I’d approach with caution and some I’d avoid altogether. Because no matter how delicious someone thinks it is, there is just no way I’m eating raw octopus. Luckily there are plenty of other options on the menu; here’s my list of 20 scrumptious, but sometimes weird, Korean meals. I’m sorry, I know I’ve mentioned it (gushed about it) before, but it truly is the best, so I think it deserves the extra mention. Veggies, meat, egg, rice, red-pepper paste (gochuchang) in a glorious mix. I could eat this every day, for every meal (and I’d be a happy girl). In my opinion, the best option is Dolsot (hot stone) Bibimbap- the rice and veggies go a little crispy from the heat, making them that much more delicious. The only downside is that it’s too difficult to wait and let the piping hot meal cool down. My impatience= a burnt mouth every time. Worth it though! Similar in many ways to Bibimbap, only not quite as good. You get a bowl of rice with barley, and then a selection of veggies, soups, meats, tofu (it will vary depending on where you are), and a few sauces. Simply pick what you want, add it to your bowl of rice, and mix it all together. And there you have it- your own custom-made meal. When you’re feeling hungover, do you ever think to yourself, ‘I really fancy some congealed blood’? Nope? Well, you’re obviously not Korean then. 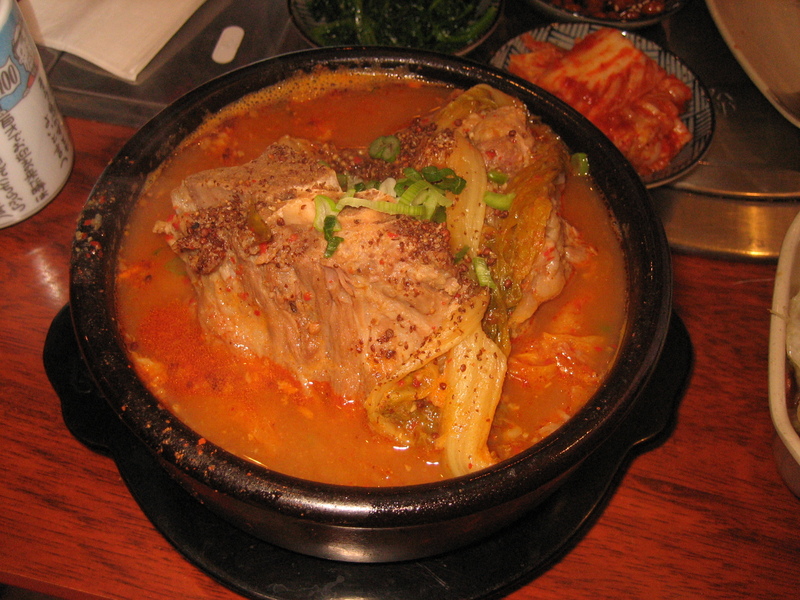 This spicy soup filled with different vegetables and, oh, congealed ox blood, is the famous Korean hangover cure. It’s not as unpleasant as it sounds, I have to admit. But, if I was feeling worse for wear, I’d still prefer a McDonald’s, thanks. Chicken pieces, sweet potato, cabbage and tteokbokki pieces (Korean rice cakes resembling gnocchi), in a warm sauce. Served on a hot plate so that it cooks in front of you. It’s slightly spicy and so tasty, it’s the ultimate comfort meal. If you’ve still got room after the chicken, you can get some bokkeumbap- rice with a raw egg- to cook on the hot plate until it’s all crispy. Mmmm. The only negative is that the chicken tends to have a lot of skin on, and there are sometimes bones. Without this, the meal would be a definite 10/10. 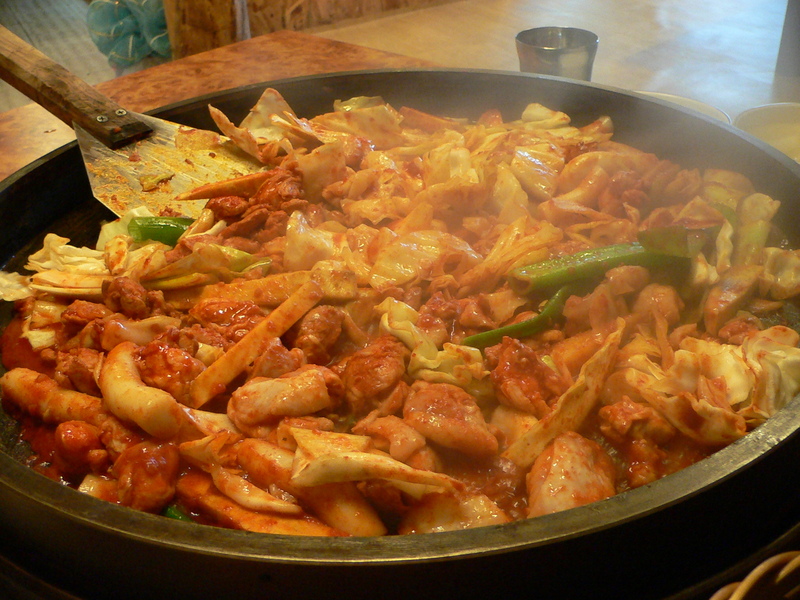 Oh, and you have to share it- get ready to fight for the hidden pieces of tteokbokki! You can’t walk down a street without seeing at least one Barbecue restaurant- they are so popular. In fact, one has just opened under our apartment, which isn’t the best thing- BBQ fumes are too tempting to have around permanently. You can pick your favourite meat, and then cut and cook it yourself. You also get a selection of side dishes. The best BBQ places, in my opinion, are those which also give you an egg mix, which you pour around the BBQ grill. The heat turns it into a delicious omelette to go with your meat. Yum yum. My winter favourite. A delicious soup full of vegetables, tender pork and potatoes (probably the only time I’ve had potatoes in a meal). 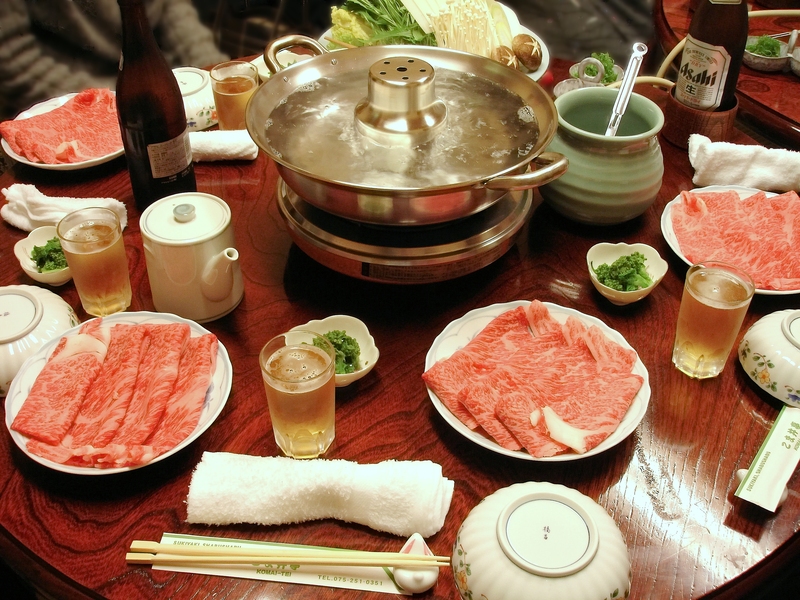 The meat gives the soup flavour and vice versa, resulting in an incredibly tasty meal. But there is one major downside- this is probably the messiest meal I’ve ever eaten, as the pork all comes on the bone. Think the messiness of ribs x 1000. The first time I ate this, I think I ended up with more food on my clothes than in my stomach. A light soup which you add veggies, noodles and wafer-thin strips of beef into. 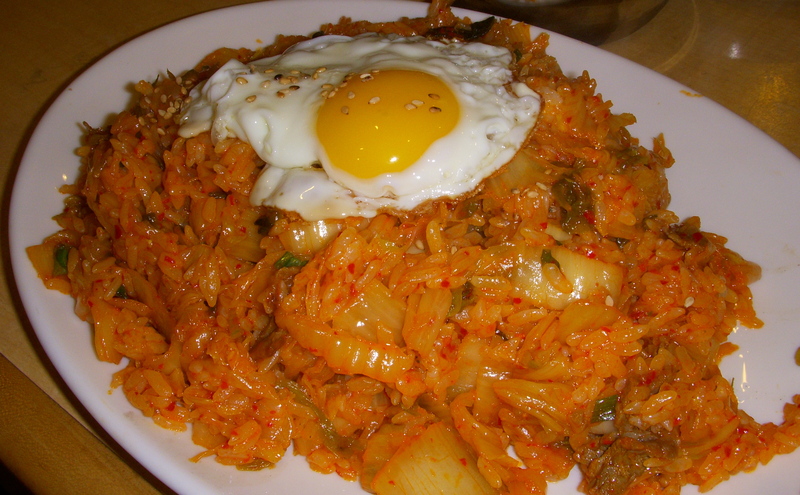 You can also get rice at the end if you’re still hungry, much like with Dakgalbi. The reason I love this meal? The rice paper wraps which you get- you have a selection of vegetables (and the cooked beef) to put inside, and a few dips including peanut, soy and sweet chilli. All the ingredients you need to make your own Vietnamese-style rice paper rolls. Be careful not to fill them too full though, I’ve had a couple of exploding rolls and it’s not pretty. Seafood and noodles in a spicy broth= warming goodness. Although spice-phobes beware: this meal can be incredibly spicy. We had a friend who took one mouthful, choked, and couldn’t talk again for a good 5 minutes. True story. In some restaurants there is also a stir-fried version of jjampong which is just incredible. Definitely worth a try, and it comes minus the spice, so it’s a good alternative for those who don’t like hot food. 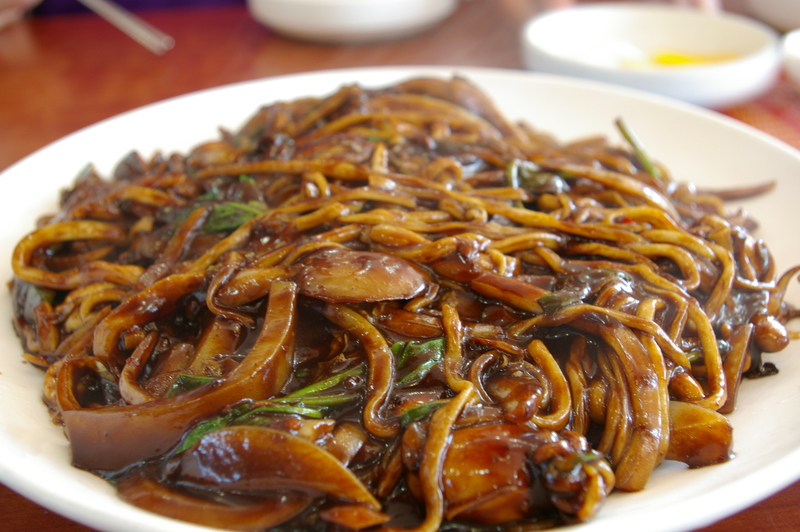 Again, noodles, but this time in a thick, almost gravy-like sauce made from black soybean paste. 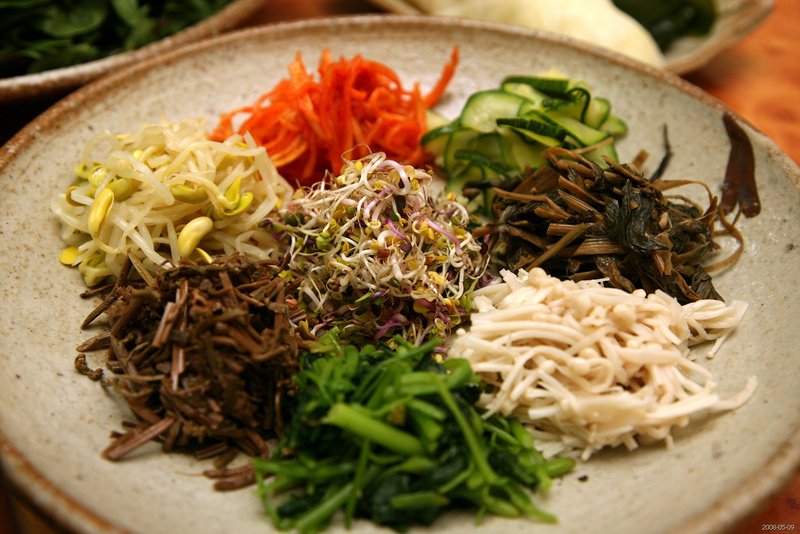 Trust me, it tastes a lot better than it sounds, enjoyed by both Koreans and expats. Another positive is that unlike Jjampong, this meal won’t blow your head off! I have to admit, I find this ‘bibim’ meal far inferior to my all time favourite, but it is nice and a good vegetarian option too. Cold noodles in gochuchang (red-pepper paste) with a few chopped veggies on top. Many pictures of the meal show an egg too, but I’ve yet to have been given an egg with mine! It’s nothing special but worth a try, and it’s a good option during the boiling hot summer months when you don’t want anything hot. While this is miles away from a Western pancake (it’s served with soy sauce rather than syrup), it’s just as amazing. A batter made from eggs, flour, a lot of onion and various other delicious fillings. 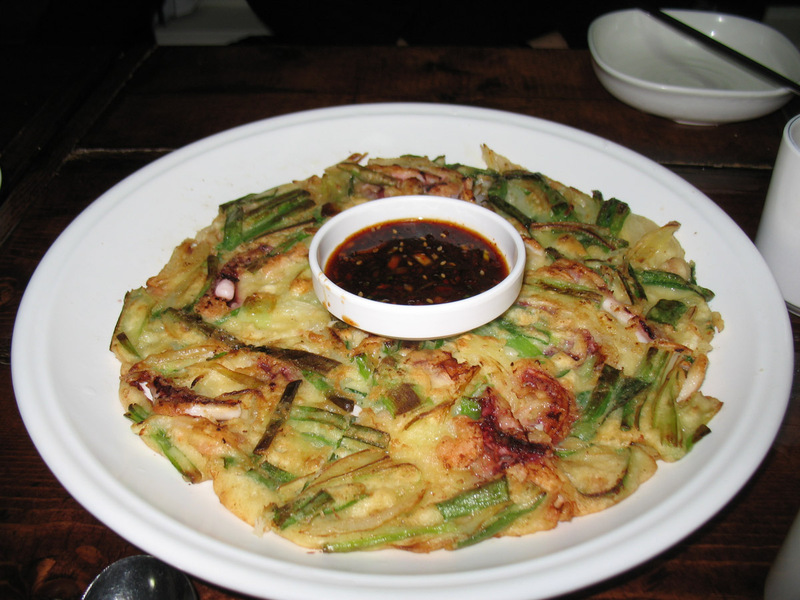 The most common is the seafood pancake, complete with shrimp, clams, squid and more. It is fried to perfection, crisp on the outside and soft in the middle, and it’s just amazing. Forget American pancakes, Korean versions are definitely the winner for me! Ok, so Mul= water and Hoe= raw fish. So when I ordered this meal I expected some sashimi-soup dish. What it turned out to be was a huge bowl of crushed ice and gochuchang (red pepper paste) soup, with a few pieces of sashimi floating in it. And honestly? The overpowering taste of gochuchang was so strong you couldn’t even taste the sashimi. One of the weirdest things I’ve had in Korea. I like gochuchang sure, but this was overkill. This has been hit and miss for me. When it’s good, it’s really good- a juicy fried egg on a pile of fried rice, along with various flavourings such as kimchi, meat or shrimp. But when it’s done badly, you end up with a pile of bland rice and a few tiny pieces of dry meat. Sometimes I’ve had it when it’s even come without an egg on top- cue anger and disappointment at a meal which is then just essentially a mound of rice. 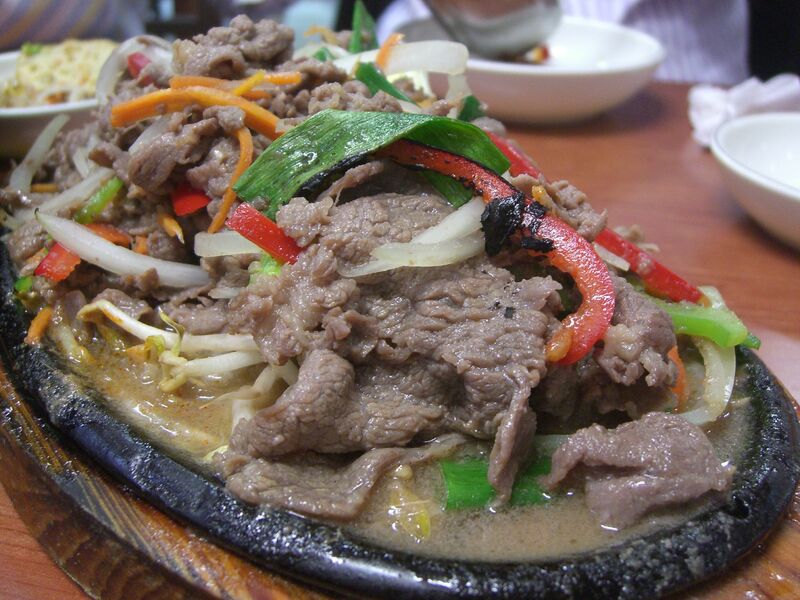 Thin strips of beef marinated in a soy-based sauce, served with chopped vegetables and barbecued. Sound good? That’s because it is. 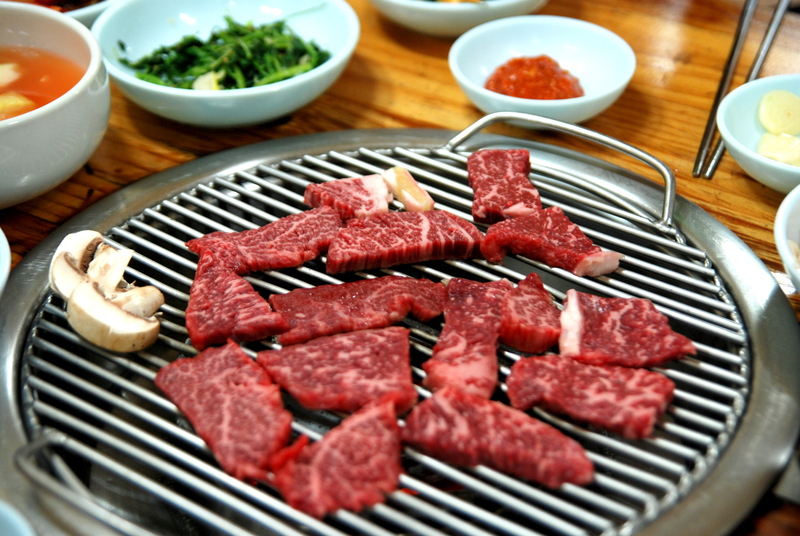 I’m not even a big fan of beef, but bulgogi has so much flavour that it’s definitely one of my favourites. 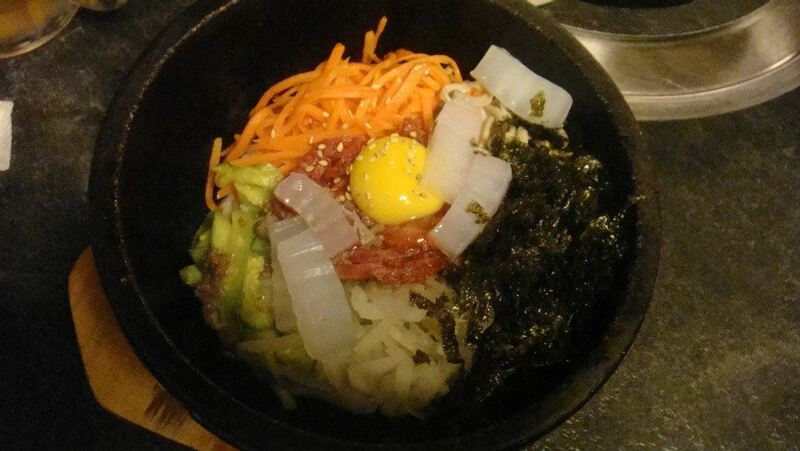 And the best thing ever is when you find a place which does ‘Bulgogi Bibimbap’. Two of the best foods served as one meal? Imagine my happiness. 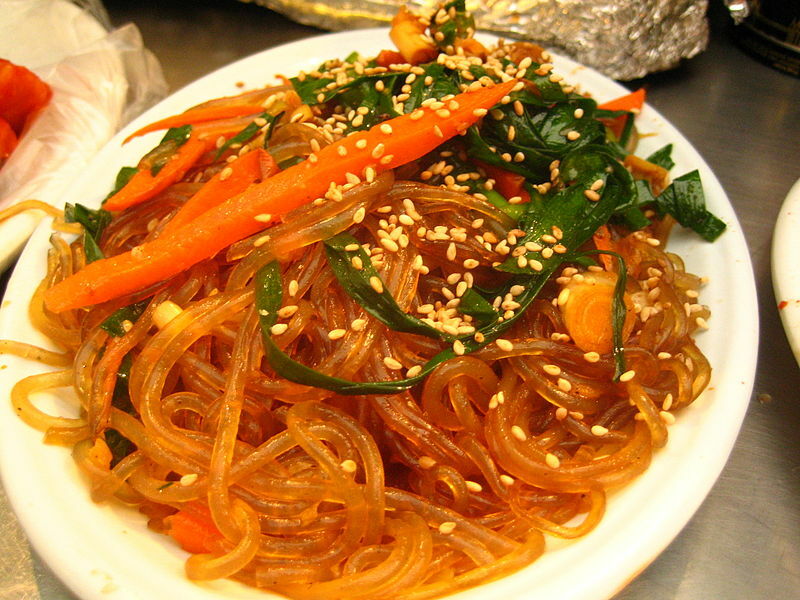 These sweet-potato noodles are stir-fried in sesame oil and served with chopped vegetables. It may not sound like much, but honestly this is the best stir-fry you’ll ever have (think chicken chow mein, only better). In case you were wondering, this carb-centered meal sometimes comes with a side of rice, in case the noodles aren’t enough for you. Good to know. So before I came to Korea I’d had tofu once and probably didn’t have the best opinion of it. Living here has changed my mind- it’s in so many meals and always tastes so good. 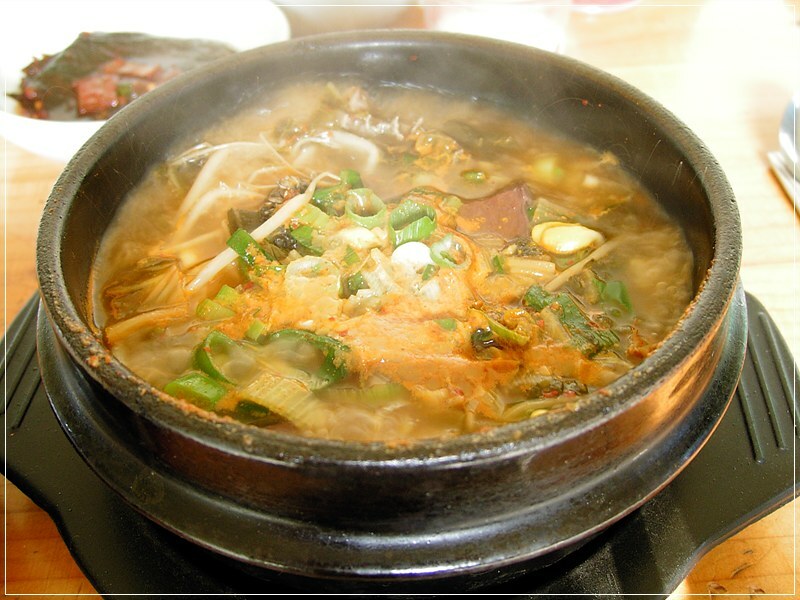 In this soup, a soft tofu is used, added to a spicy broth along with other ingredients, seafood and meat being two poplar options. Oh and the little Korean twist to make it different? A raw egg is cracked into it at the last moment, so that it cooks in front of you in the boiling hot soup. 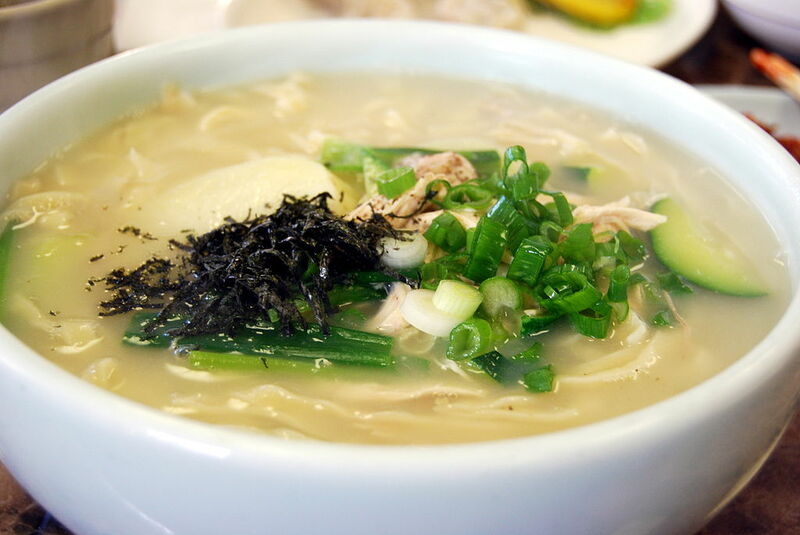 Served with rice (surprise) and different side dishes, this is my favourite Korean soup. The Koreans adore fried-chicken. It’s slightly different from Western style because it’s fried twice which makes it less greasy and more crispy. 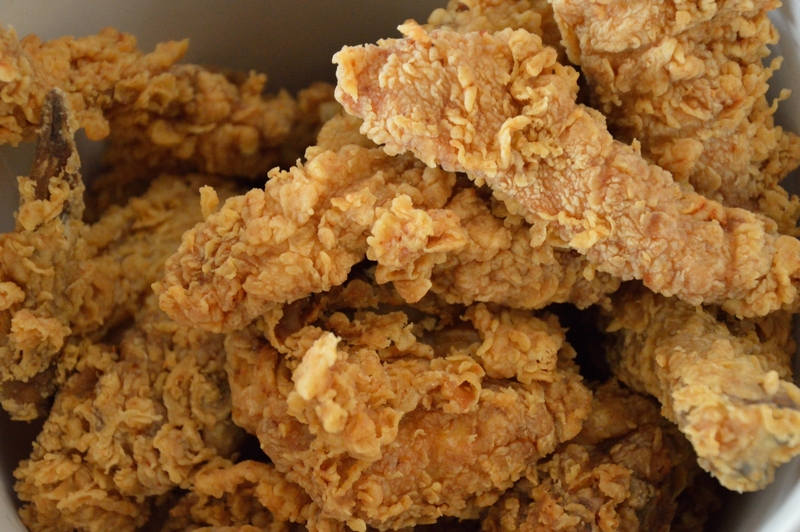 It’s the most common way in which chicken is eaten- so much so that unlike Westerners who speak of chicken as a healthy meal, Koreans call chicken ‘unhealthy’ and ‘junk food’. 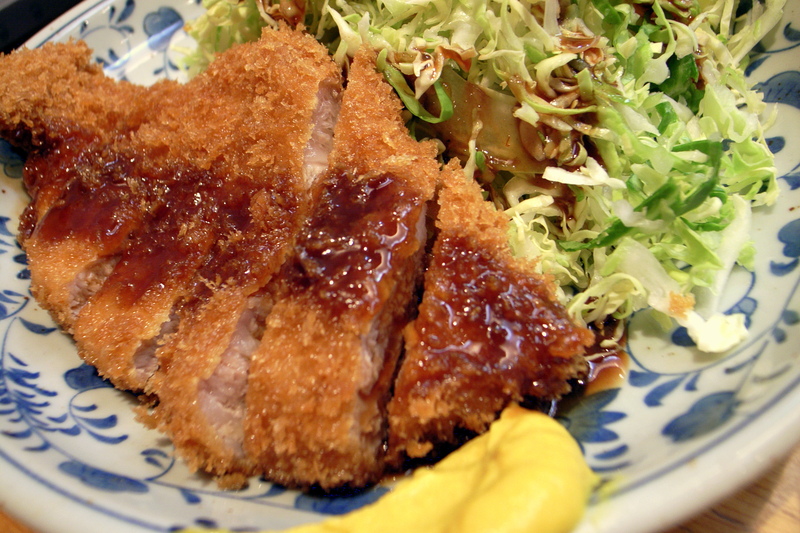 This deep-fried pork cutlet is similar to schnitzel and served with a thick sauce which is similar to gravy. 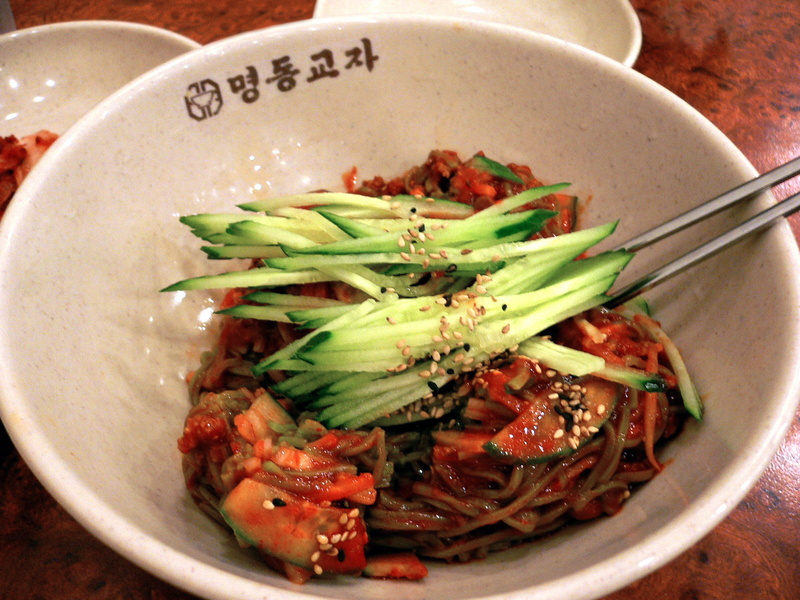 It’s another popular dish among Koreans and is filling and satisfying. If you’re a big-eater you will be pleased by the portion sizes which are generally huge- I swear I’ve had plenty of Donkas which are roughly the size of my head. I’m not complaining though. This fresh noodle soup is delicious- you get a large bowl of broth (different flavours such as meat, seafood, mushroom etc.) filled with ‘knife-cut’ noodles. 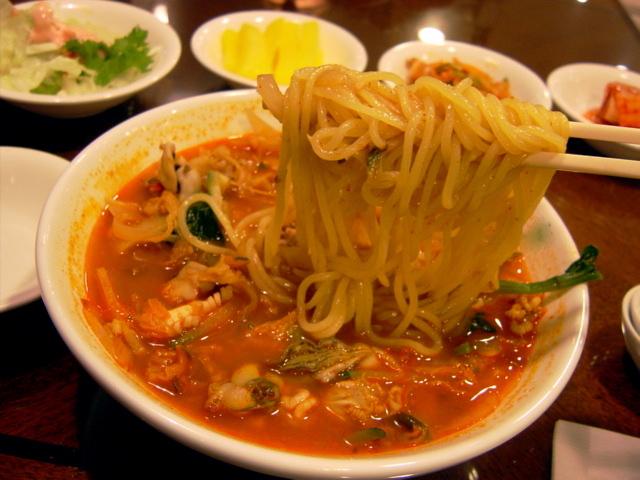 The noodles are, in my opinion, the tastiest you can get in Korea. Word of warning- this meal is one of those where you feel as if you’ve eaten forever but just doesn’t go down! I usually end up in an uncomfortable food coma, too full from gallons of soup and heaps of noodles. But if you’re not too full by the end, you can once again order rice to cook in any leftover soup. We just love the carbs! 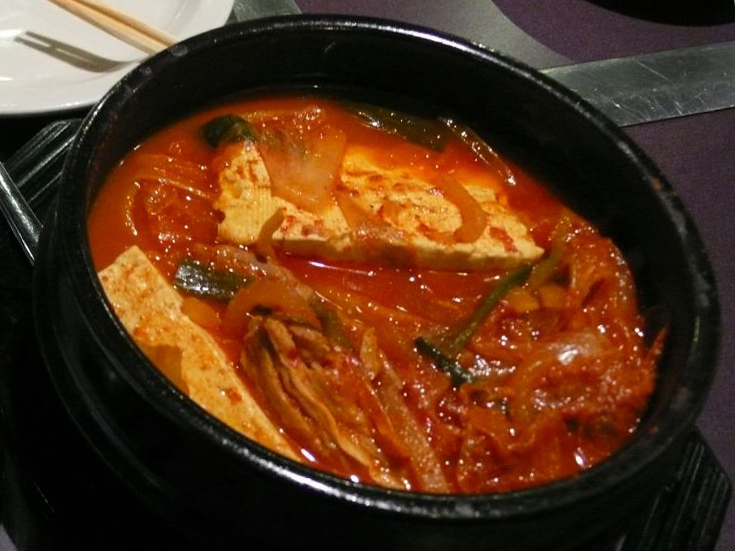 There are so many different types of jjigae- kimchi, meat, tuna, tofu, seafood, vegetables, the list goes on. And even in one bowl of jjigae there are so many different ingredients and it changes wherever you go. 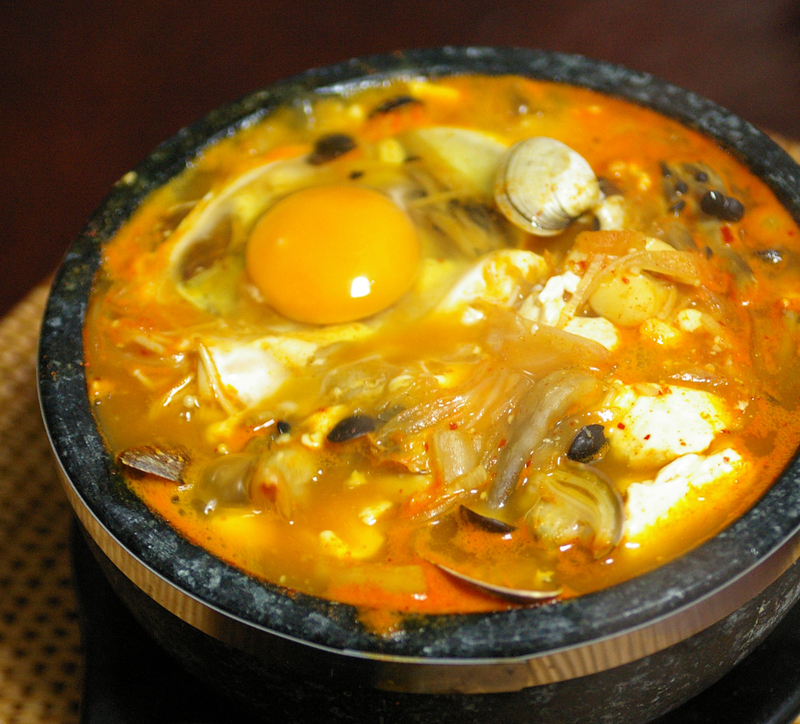 The main thing is that jjigae is a staple meal, a warming, comforting stew. Much like Sundubu it’s served piping hot so always ends up burning your mouth (or is that just me in my impatience to eat?). But never mind, it’s good so we forgive it. I never feel more Korean than when I order a bowl of Kimchi Jjigae and eat it alongside a hefty side dish of Kimchi. Forget my alien residency card, I think that makes me a fully-fledged Korean! Ok, so I’m not going to lie and say that I never crave an English meal- there are times when all I want is a big fat roast. 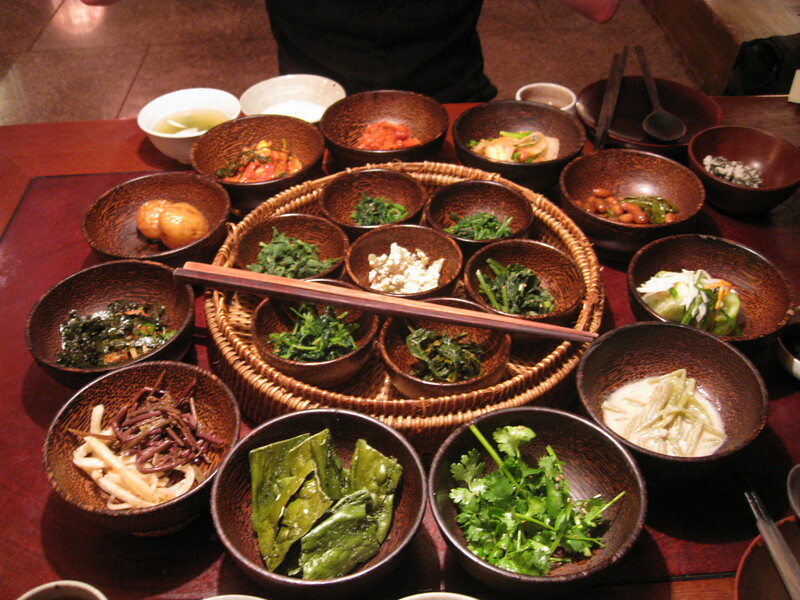 But, as proven by the list, there are plenty of scrumptious Korean foods to satisfy my taste-buds. And lucky for me, this food is cheap and healthy (if we forget about the fried chicken). 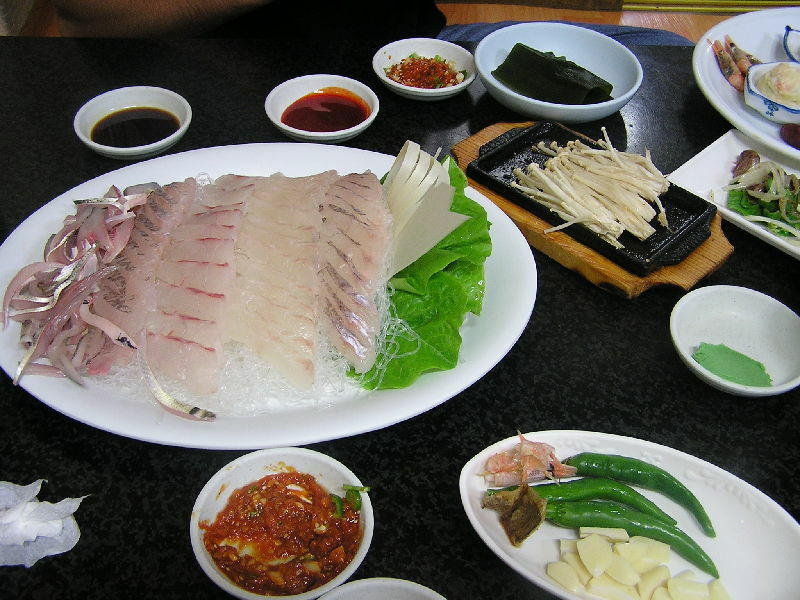 So all in all, it’s really no wonder that Korean food is becoming the new ‘trendy’ cuisine in other countries, with restaurants opening all over the place. And I, for one, am extremely happy about that.